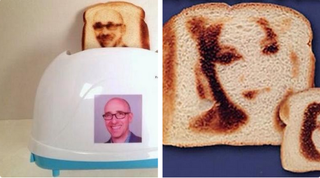 A company is selling toasters which can put your selfies on a piece of toast. According to Jenn Harris at the LA Times, (which is nobly stepping up its bread beat, from the looks of it, going after that elusive Pulitzer for Baked Goods reporting), a company named Burned Impressions in Vermont is selling toasters that make bread selfies. For the bargain price of $75, you can buy a signifier of the end times, aka a toaster that will burn an image of you onto a piece of bread. It's the same company that created the Jesus toaster and the Rapture toaster with images of Jesus and bodies floating up toward the sky. If you want a selfie toaster, you'll need to send a high-resolution photo of your face to the company, which will then make your custom selfie toaster in about a week. But not all photos will work. Every morning, instead a bland old breakfast, you can truly indulge in narcissism by devouring your own beautiful face or the face of a dear loved one. The product is available via the company's website which boldly declares "you don't have to famous or Jesus to have your face on toast!" Yes, screw winning an Oscar or being the savior of humanity, having your face on a piece of pumpernickel slathered with butter is a real sign of success. Image via Better Recognize Twitter.